LONDON: Hordes of British Christmas shoppers swapped the High Street for the internet on “Black Friday”, leaving stores unusually quiet but delivering Amazon its biggest ever sales day in the country. 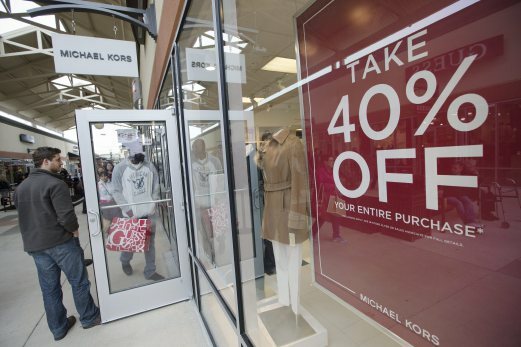 Last year saw frenzied scuffles over bargains – scenes that are common in the United States, where the marketing tradition began, after customers had queued hours before opening times to get first pick of the deals. But this year, stores around Britain were serene as consumers shunned the crowds and shopped from the comfort of their home or office. Amazon said at 9.10pm (2110 GMT) that more than six million items had been ordered through its British division, breaking the sales record set last Black Friday when more than 5.5 million items were sold – equivalent of around 64 items per second. “For the second year straight, customers in the UK have blown us away with their response to the many great deals on great products that we’ve made available for Black Friday,” said Christopher North, managing director of Amazon.co.uk. Experian has predicted online sales in Britain to exceed £1 billion (1.4 billion euros, $1.5 billion) for the first time ever. Bryan Roberts of analysts Kantar Retail said Black Friday appeared to be “something of a damp squib” in city centres and shopping malls. A handful of people waited outside the flagship Oxford Street department stores of John Lewis and Debenhams, which opened early and laid on 400 extra staff to deal with the expected rush. A few shoppers arrived early, such as Kevin Regan, a construction manager from Enfield, who came two hours before John Lewis opened in the hope of finding a discounted laptop. “It’s my first time doing it, I hope they do it more often,” he said as he waited for the doors to open in front of rows of signs advertising the sales. When security opened the doors the dozen people waiting filed in to quietly browse the stacks of discounted goods, outnumbered by armies of staff and journalists. In contrast, online retailers saw heavy demand, with very.co.uk reporting a surge in traffic at 0700 GMT when hourly deals began, Tesco warning that purchases would take longer to deliver due to demand, and the Argos website straining under the pressure.